The Clacks system was actually introduced in the 24th Discworld novel called "The Fifth Elephant", however its the "Going Postal" book where we learn the full history of the Clacks system. For each clack, we read the pattern from the top of the first column to the bottom, then from the top of the second column to the bottom. A light in a position represents a 1 value and no light represents a 0 value. This gives us our 6 number pattern for each clack in the alphabet. The initial data structure chosen was essentially just modelling each individual clack. Since a clack is a 2x3 structure, the simplest way to represent a clacks is to have a vector that contains 2 vectors, each with three elements. Before we define the complete alphabet using this data structure, lets test if we have the right data structure for our conversion process. Although the code is simple for 1 character, it does highlight the problem of converting the whole alphabet. We would need either a deeply nested set of if statements or a very long case statement, neither of which seems to be a particularly functional approach or idiomatic Clojure. Even if we did use a case statement, how would we convert a clack back into a character? So perhaps we need to change the data structure, one that provides an easy way to map to values together. Also, there seems no value in mapping values to a 2x3 grid as long as we consistently express a clack. Its very common to use Clojure keywords for the keys, to make it easy to look up a particular value by referring to the keyword. The -> character is part of the function name. This is a Clojure naming convention used when the function you are defining converts from one type to another. Now we want to convert a whole word to a clacks sequence. It seemed the easiest way to convert a whole word was to convert each letter at a time using the map to look up each clack code, returning all the clacks codes in a sequence. So we redefined the string->clacks function to take in a whole word. We used the map function to apply a conversion function over each element in the word (each element of the string). This conversion function called clacksify. Now we could convert any word that used the letters of our limited alphabet. We chose bat as a simple word. As we are passing a string and not a keyword to the clacksify function, then we first convert the string to a keyword using the keyword function. Is there a simple way to look up a key given a value that is unique in the map? All Clack codes are unique in the map, but there did not seem to be a simple expression to find the key when given a value. We could have created a second mapping, however having two maps seemed redundant and a potential cause for silly bugs. The answer was simple once we found it. 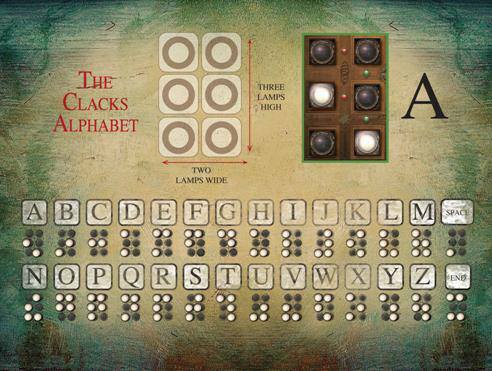 As the clack codes are unique, they could be used as keys for the letter values, we just needed to swap the map around. Swapping a map&apos;s keys and values was done by writing a reverse-map function. "Reverse the keys and value pairs in a map. Allows the map to be used to convert from a clack to a letter without defining a second map"
So we defined the function declacksify which takes a clack code and returns its corresponding character. The clack code returns the corresponding keyword rather than a character, so we use the name function to convert the keyword into a character name. Its probably at this point we should have realised that we didn&apos;t need to use keywords to represent the characters of the alphabet. In fact, using keywords made a little more work for us. Our clacks->string function returns the right result, but not quite in the format we want. Rather than a single string, we get the individual characters. Thanks to a flexible design with no side effects or side causes then its really easy to replace the English language alphabet with another language that can be encoded into Clack codes. So languages based on the greek, latin or cyrillic alphabet could be send if a suitable alphabet with clack codes is supplied. We were quite happy with the code produced in this dojo. The code is pretty readable we believe and we have taken a fairly simple approach to the design. In hindsight we could have made the code even easier if we had tested out the map data structure a little more and used a string character for each letter in the alphabet. Working in an editor attached to a REPL worked well (Vim in this case, but not relevant to the development of the code). The behaviour of the code was tested with almost every expression, so we gained a good understanding of each line of code. There are ideas to take this further and show a visual representation of a message passing through a chain of clack tower, showing how the message would pass through the system at a human speed. This would assume a fixed time to show a clacks between each clack tower and a minimum level of speed by the human part of the clacks tower. No REPL&apos;s were harmed in the making of this code, although one REPL was heavily used.